Advice from the “Old White Guys”: Alberta Progressives Listen Up! The Republicans may hold the secret to the progressives’ return to power…yes, seriously! Darrell Bricker and John Ibbitson in their glib little book The Big Shift argue that Western Canada, particularly Alberta, is responsible for the tsunami of support that carried Stephen Harper to victory on May 2, 2011. To be clear, Bricker & Ibbitson didn’t say that Mr Harper’s success rested solely on Alberta’s shoulders (thank God). Ontario’s suburban middle class (area code 905) and immigrant voters helped push Mr Harper over the top. 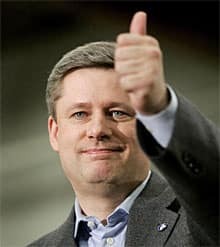 Bricker & Ibbitson proclaim that Mr Harper will be ensconced at 24 Sussex Drive, like a barnacle on a rock, for a long, long time unless the progressives adopt his winning strategy; namely recognize that Canada made a seismic shift to the right and cater to it. Apparently Mr Harper’s 4 point strategy (reduce taxes, balance the books, promote the military and crack down on crime) resonates with the New Canadian Right in a way that the progressives’ passé policies never will. Taxpayer-funded private healthcare and private education, here we come! The “big shift” to the right would be the death knell of the progressives (federally and provincially) if it were true. But it’s not. Whew! Instead of sifting through the ashes of unreliable polling data (remember the polling fiascos in the Alberta and BC elections?) and extrapolating the results to the burgeoning immigrant population, it’s time to gaze into a new crystal ball. As luck would have it I happen to have one right here. Voila! The report of the College Republicans National Committee entitled “Grand Old Party for a Brand New Generation”. Enter the Republican Party…Yes, seriously! The CRNC set up six focus groups comprised of young voters from both ends of the political spectrum. Their responses revealed not just how they viewed the Republican party, but more importantly, how they viewed themselves. Young voters wanted to be seen as intelligent, hard working, caring and open-minded. Their feedback was replete with comments that no doubt knocked the socks off the “old white guys”. The CRNC responded to this feedback with five recommendations, one of which was to develop a reputation for being “caring” by linking economic growth and opportunity to “caring” policies. Note: I’m not saying I believe the GOP has changed its spots, simply that the Republicans (of all people) finally figured out that young voters will not support a government that doesn’t care about its less fortunate citizens. Bricker & Ibbitson got it wrong. The progressives don’t need to become a “me-too” party that caters to the New Canadian Right. That’s the purview of the “old white guys”. Instead, the progressives need to understand the underlying message of the Republican’s report—young voters want to be perceived as intelligent, responsible, caring and open-minded and want to belong to a political party that exemplifies these qualities. Young voters have recognized that “it’s not all about me” and are prepared to vote against parties that are so stupid, uncaring, narrow minded and selfish that they’d destroy the social safety net in order to shave a few bucks off the austerity budget. Now here’s the catch. In order to get back into power progressive parties need more than just the right progressive values. In addition to being intelligent, responsible, caring and open-minded, the progressives need to be unselfish. They will have to cooperate or even merge in order to communicate the message that “we really are all in this together”. And if that’s not the definition of a democratic society I don’t know what is. ***Grand Old Party for a Brand New Generation” p. 86. This entry was posted in Politics and Government and tagged Harper, Republican Party, The Big Shift, Young Voters. Bookmark the permalink. 15 Responses to Advice from the “Old White Guys”: Alberta Progressives Listen Up! It is interesting that the Republican party in the USA is doing what the Alberta Progressive Conservative Party has recently been doing and what the Harper Conservatives are now starting to doi=–which is remorphing as the caring party of the right. It would be amusing if it were not a cold calculated strategy to win back disgusted Tory voters and their children who are (right this very minute) being trained by their mummies to go left and never vote Tory again. If we can’t do it one way (vote them out in our time) –we will do it another way (vote them out in our children’s time). This transition to the gentler, kinder Tory state was begun by Redford. Unfortunately the mask got dumped as soon as the Tories got elected in Alberta. If we look at the situation in Alberta under Redford, we don’t get acts but we do get chatter about being nice and kind and all that stuff associated with the left— for example–we have folks talking about more transparency in the foster care system—- by giving us the figures on how many children died in the care of the government over the past two years. We have the government opening (or at least trying to open) a home for a few homeless men in Riverbend, Edmonton–the first home in a wealthy neighborhood and who knows we may even get the richest of the rich in Glenora to accept a home for the street people soon –all so that the provincial Tories can show themselves to be caring and loving people who haven’t ripped us off for forty years and more in terms of our oil royalties. We have the chatter about the homeless even at Edmonton City Hall where the mayor says that one of his most heart warming acts as a mayor for the rich was helping out the youth on the street and connecting with the new immigrants in the African community was far more gratifying to him than his success in putting my kids in debt for payments to a billion dollar Katz arena (for it will be a billion dollars –no doubt about it). Though Mandel talked about important, often controversial infrastructure projects like the redevelopment of the City Centre Airport land, he said many of the things that he is most proud of were the wins on the social side, like helping to find a new home for iHuman Youth Society, a non-profit organization that helps at-risk teens, or building the city’s relationship with the African community. “The social side and the cultural side was far more important to me, but we need to build on infrastructure because that’s really what a city is all about,” he said. You see all the sweetness and light spreading from the city council (despite my Councillor’s less than welcoming comments about tattooed men at playgrounds menacing my sons through the Alberta Legislature to the federal level; even Mr. Harper is getting in on the loving kindness to all and goodwill to the children. Instead of gifting the royal baby with things he doesn’t need he is donating money to a children’s charity (why not give it to the group that Velvet Martin belongs to that can’t be classified as a charity because it is going after government acts of negligence against our children in care—Protecting Canadian Children?). So the right and the far right have picked up on the warm fuzzy things that we want (but not at the cost of increased taxes) and are going to give us what we want. But under all this sweetness and light —you have the same old people who haven’t got us the right rate for our non-renewable resources, who are managing the province as incompetently as they usually do with boom and bust economics to destabilize the operations of essential departments of education and health; you have the nonsense of bad, incomprehensible budgets that even the Auditor General of Alberta can’t figure out (or at least he can’t figure it out so that I can understand the budget) and you have money that is lost by the federal government that they can’t seem to account for –$3.1 billion dollars (and yet we aren’t up in arms about these new accounting practices at the federal government level?) /The Tories have scammed, ripped us off and walked all over us and we are to believe they have changed to the nicest kindest most humane folks on the political block? Can we ever believe them after Redford’s betrayals and Harper’s anti-democratic omnibus bills–not to mention the gutting of environmental oversight, the ignoring of the collective rights of our First Nations people and the failure to address the ongoing genocide of the aboriginal children in the care of the government (for this is a shared responsibility of the federal-provincial and First Nations peoples). The Tory party at all levels copies the Republican Party from the USA so their morphing to the values of our nicer, kinder children should not be a surprise to us. The right has learned to reinvent themselves to stay in power. We’ve fallen for this reinvention every single time. I’m hoping the young folks won’t be as dumb as we have been (the old folks). I’m hoping that if I teach my sons well — that they will never be fooled again by the surface of this party that has in my opinion–deceived, taken advantage of our political naivety and betrayed us. I’d say the right in Alberta has even been negligent with reference to health, children in care, education, seniors, the homeless, and the environment—-especially with reference to pollution by the oil industry—just look at the case of Jessica Ernst and the residents of Rosebud, Alberta. There is no justification for any government to ignore this case of drinking water in wells going on fire and yet this is what our provincial government did and still continues to do. There has been a relative blackout with reference to the extent of pipeline spills in Alberta that has been troubling as well. Why didn’t we know about the continuing problems in this area? Why don’t we have an EPA type registry and follow up of the science done on each spill to prove the government’s contention that there was no contamination of the land, air and water? Where are their environmental testing results? How do the results of sampling of air, land and water after pipeline spills compare to baseline test results? Does the government do any testing or is it left to the industry to do this work? If so why can’t we have it on the government regulator’s website? Why must we pay for our own information? Why must we search for our own information that we pay for with our tax dollars? Why do we have “best in the world regulation” and yet tailings ponds for forty years and more are being converted into a new lake district for our children with unknown ramifications for our environment? We would not even have found out about the 2 spills per day from pipelines until Global News did an investigation. We would not have found out that less than 1% of infractions by oil companies are followed up by our provincial government until we got the bad news by two private citizens investigating the government of Alberta. New study reveals shocking details about provinces tar sands regulation and enforcement. The Alberta government has made a lot of ‘world class’ claims relating to its management of a growing tar sands industry. Over the past few years, two researchers, Kevin Timoney and Peter Lee, decided to put those claims to the test and yesterday they published the results of their tireless investigation. The results are pretty startling. From 1996 to the mid-2012 period the researchers uncovered over 9,262 environmental incidents in the tar sands region pieced together from spotty government records. That number averages out to be almost 2-per day. Over four thousand of those incidents were apparent violations of Alberta’s environmental laws and regulations, 86% of which were done by either Suncor or Syncrude. And so under the surface of supposedly good governance –under the surface of supposedly “best in the world regulation” we have some problems that indicate to me that the Conservative Party of Alberta isn’t as it seems to be. It seems to me that, unfortunately we have the same old incompetent folks acting poorly and serving big oil rather than the people of Alberta. There’s an Alberta Advantage and big oil in Alberta has that Alberta advantage. If the left and progressives don’t coalesce as you have said in this post–to show the same sort of mutability –as the right has learned to do in order to keep power in this endless fashion—-we will be stuck with these wolves in sheep clothing until the bitumen is gone. I no longer believe the wolves will do anything more than tear the lambs among us to bits–no matter how carefully they reinvent themselves– and somehow –I just can’t get over the story of Samantha Lauren Martin–to believe their Dorian Gray image. 3. Don’t concede “caring” and “open minded” to the Left. I’ve set out what the GOP said about “caring”. Here’s what they said about “open minded.”…“yes, we face serious difficulty so long as the issue of gay marriage remains on the table. In the short term, the party ought to promote the diversity of thought within its ranks and make clear that we welcome healthy debate on the policy topic at hand. We should also strongly oppose the use of anti-gay rhetoric”. So that’s their short term plan—talk the talk, but don’t walk the walk. Can’t wait to see their long term plan. 4. Fix the debt and cut spending but recognize that “restructuring” (ie cutting) “big government” is a non-starter with young voters. This leaves the GOP in a pickle because it undercuts their ability to indiscriminately slash government to show the people they’re doing something about government (misguided though it may be). I don’t think they’re capable of developing a strategy to determine what needs to be cut, if anything, and why. The Redford/Horne cuts to home care and the nurses are a classic Republican approach and look where that got them. 5. Go where the youth are to get your message out. The Republicans were shocked that young republicans watch The Daily Show and get much of their news on the internet. The report said “it wouldn’t hurt to have [candidates] target ads at people who watch re-runs of Family Guy”. Bottom line: The GOP “transformation” is nothing more than window dressing, but no one expected anything else, did they? Gerrymandering works nicely with ‘first past the post’. Which is how in the last federal election the Sask. Federal NDP received double(?) the popular votes of the Sask. Liberals, yet the Liberals were the party to get the seat. Also, in the last national election the (not so fiscally) Conservative Party may have received over 6 million yea’s nationally in the popular vote, but the New Democratic Party formed the official opposition with just under 5 million… and who knows what the count would have been if not for the so-called ‘RoboCall’ scandal. Add to that the millions of votes the Liberal Party received, and you can see how it is with great hubris that the Conservatives claim a majority government after receiving roughly 26% of the eligible electorate’s actual approval. Excellent points Goinfawr, all of which point to (1) the need expose the duplicity in the “kinder, gentler” Redford government and (2) ensure that the progressives parties understand that if they continue to splinter the vote we’ll never get out of this quagmire. Absolutely outstanding, Susan. I wish I had written it. On a political level, there has already been a shift to the right in the last 3 decades in Canada. The current Liberals are not much different than the Conservatives much like the Democrats are no different that the Republicans. In his book, The Death of the Liberal Class, Hedges spells this out clearly. I believe that his thesis also applies to Canada. Furthermore, links can be drawn between the two countries in the roles of corporations and how, through lobbying, political funding, for example, they have been able to influence governments to change the rules that resulted in political landscape favourable to them. The end reult is tht economy leads and society follows. Getting rid of the ‘excesses of democracy’ has been achieved. Have you noticed how each blip that occurs (Syria, Egypt etc) anywhere in the world, the first thing reported is how stock markets are affected? Our pension plans rely on the the marketplace which may not always be in our best interest. Case in point, pharmaceuticals – if we want our investments to grow, it is important to sell prescriptions, lots of them. This translates into over medicating people and that has social costs not to mention more residuals from medications ending up in our rivers and lakes. A point that clearly stands out in my mind are the thoughts of John Ralston Saul who who also presented us with the idea that society should lead and economy should follow. Think how different life might be if that idea was to be invoked by society. Ted, I’ll have to check out the Hedges book, sounds like it is very relevant to our situation. I came across some US statistics in the Aug 2013 Saturday Evening Post that illustrate your point about the unseemly relationship between the government and big business in the context of company-provided healthcare coverage and pensions. In 1970 70% of Americans who worked at companies with 100+ employees got fully paid health coverage but by 2000 this dropped to 18%. The same is true with respect to retiree benefits: in 1980 84% of employees at companies with 100+ employees received company-paid lifetime pensions. By 2006 only 33% had company-paid pensions. The remaining 67% were switched into 401(k) plans (like our defined contribution plans) with a modest company match. This dropped the company’s costs from 6 to 7% of payroll down to 2 to 3% of payroll. The shift from life time pensions to the 401(k) plans hit the employees hard. In 1950 employees paid 11% nationwide for their retirement costs, but in the mid 2000s they paid 51%. The article said that the employees saw this drop in company benefits with no real off-setting increase in pay. But compensation for CEOs and senior executives continued to sky rocket. Tragic. It would be very helpful to find out whether the Canadian statistics line up the same way. Great post Susan as always. I do not agree with this book at all in their so called Big Shift to the right in Canada. I do agree that politics in general moved to the right but to me 39% of the vote does not mean at all that Canada has changed that much. Harper was lucky that there was no Liberal party at all during the last 8 years. There has not been one for a long time anyway. Even under Jean Chretien the Liberal party was the party of cutting taxes to the big corps. The only party that had some progressive ideology was the NDP and the Greens. Had the NDP become government, I doubt that much would have changed. Big money would have threatened them to death and I doubt that even Jack Layton would have confronted them and their scare tactics because we all know that most Canadians are not willing to suffer finacially at all in order to change direction. More progressive politics means for sure higher taxes and it takes a great politician in order to do that and see it through for a better more equal society for everyone. A couple of years back an experiment was done in Sweden to measure taxation levels acceptance and they found that most nordic countries never complained until the level reached 65% whereas in North America people were already besides themselves at 35%. With this level very little can be done these days. Also at higher levels a society can only operate fairly if taxes are collected from everyone, not like we do here where the very rich are allowed to do whatever they want and pay almost nothing and the rest of us are deducted at the source. We all know that no government of that last 3 decades has been serious about going after those that have the good lawyers and accountants that take their money to foreign banks to the total of 7 biilion in tax value every year. This is an estimate of course, I am sure it is more than that. Young people have realized that with gobal competition from countries like China where people work for peanuts (for now), and with a Canadian political class that is willing to sell everything including their own families as long as they get some benefit from it, that they need a new direction. It is clear they pay very little attention to what is going on and I do not blame them. I would be with them in case of a Canadian Spring which is not impossible. Fighting for democracy is still a worth while project. Kicking this decrepit political class at provincial and federal levels a dream come true. This idea of parties changing to adapt to voters and get elected is terrible and it is gaining a lot of momentum. People unfortunately are buying into it and even discuss it and adopt strategies to make it look like an ice cream when in fact is chicken crap. The WIldrose is the worse one on this front. Danie Smith does not have any problem at all saying the opposite of what she believes in order to appeal to the electorate. She has said several times that members of the wildrose should not be teeling the media anything to do with controversial Wildrose policies until they get elected. This is called decieving and lying but it is alright in politics. As long as one gets in, that is what matters. The rest is just election tactics. Quite remarkable. Excellent comments Carlos. I want to pick up on one in particular. You mentioned that Sweden (and I suspect other Scandinavian countries) will accept a much higher level of taxation than the US and Canada. Sweden is also high in “social trust”–a concept that corelates with voter turnout. High social trust is aligned with high voter turnout, low social trust aligns with low voter turnout. And guess what, you get high social trust in societies which exhibit economic equality and equality of opportunity and low social trust in societies polarized by economic disparity between the rich and the poor. How about that! Susan I could not agree more with your comments. Social Trust is without any doubt the most important aspect of a successful society. This is where I have a great concern about Canada because I think that we have lost a lot of that trust we had for government, politicians, courts and police. I have no doubts whatsoever that this is a consequence of the last 3 decades of Neo-Conservative politics where distrust for government is what they think is fundamental for more comptetition, less regulation… and all that pipe dream. To regain this lost trust is extremelly dificult and the Neo-Conservatives know it and that is why they try to brake it as often as they can in all different fronts. Unfortunately they were very successful and the results are quite obvious. Of course we are still high on social trust as compared to the average country but reversing the trend to more social trust rather than less is fundamental if we do not want to continue the fall into the mediocre standard of living. The idea that only the GDP, the exports and all those wonderful market numbers count is silly and dangerous. Live within our means YES but just more and more and more production without any clear objective other than selling our natural resources to the bottom feeders is idiotic and will take us nowhere. Yes you are absolutely right that high social trust aligns with higher voter turnout and it is stronger in societies with less inequality. It makes sense that people feel less exploited and more protected from the economic disadvantage and so trust more and are more interested in participating in a fairer game. As far as Democracy, no doubts despair is not an option. My only despair is that I cannot see how we can make the necessary changes within the present context without some form of strong upheavel. Carlos, you’ve flagged an extremely important point—once social trust is lost it is very difficult to get back. Bo Rothstein and Eric Uslander, political scientists, writing in World Politics Oct 2005 explain it as follows: In societies with low social trust, social trust doesn’t increase because massive social inequality persists and policies which could remedy this situation can’t be implemented because there’s a lack of social trust. Canada and Alberta haven’t sunk into complete inequality and corruption yet, so we still have a chance to use the political process to stop the slide into inequality and political favoritism, but we’ll need to be very focused in the upcoming provincial and federal elections, and give serious consideration to voting for the best progressive candidate, regardless of his/her political affiliation. Susan I am glad some people agree with me on social trust. I have lived in a society with a very low social trust and I left because I do not believe it is possible to reverse it without some major shake up like a social revolution of the kind we saw in Russia in 1917. The problem is that those revolutions have two major hicups – one is that 9 out 10 they are headed by people who have in mind get what the elites of that society own and change nothing other than the slogans. They impose severe brainwashing and total control of the media to the point where people really believe they have it good. This is what happened in Russia where a Mafia took over and was able to control it for 70 years. By the way, despite all of what they went through, they have a second Mafia in power now. The second problem is that once the honeymoon is over and the hardships of financial changes take over, it is very difficult to maintain the necessary pace of change and things get back into the same old same old except the faces are different. In other words, the pile is the same but the flies chang. This is now happening in Lybia, Tunisia and will continue to happen. In democratic societies it is still possible to manage it better but the financial interests are too great to ignore. We are no longer in 1947 when governments were all powerful and run by people that after the war only had in mind to make things better for everyone. Today, companies are way richer than governments and they are protected by law to challenge government power. So the question is, is it or is it not possible to change a so called democratic society like ours? I doubt it and I think that is the reason we go in cycles of destruction and rebuilding. If we had a system closer to real democracy and the population was more evolved I think maybe it would be possible, but we are not there yet. Will we ever be there? Again I do not know but again I doubt it especially in Alberta. I see no politician here with the charisma or the mental capacity to make such a change. So the conclusion is that the system is actually run by the events outside of the control of most of us like war, company poser, elite power……etc. Susan I share your interest in trying same change next time but if I may, how do you think that is possible in this province and what candidate are you talking about? Carlos, sorry about the delay, I’ve been traveling and couldn’t respond to your comment earlier. You’ve hit the nail on the head with your last question. I don’t think any one of Alberta’s progressive parties will be able to get enough votes to assume power in the next election, the PCs will end up with a minority government or become the official opposition to a WR government. Some of the progressive parties say that they are playing the “long game” and their objective is to gain a foothold in this election and then assume power in the next election, but I don’t see this happening unless there is a major change in the structure of the progressive parties. (Yes, this is going much farther than what I said in my last comment). The progressive parties have to find a way to come together either formally through a merger or informally through a binding cooperation pact. This will cause confusion and anger among their established voters so this should happen sooner rather than later to give the “new” progressive party the time it needs to (1) reassure the “old guard” progressive voters that the merger/cooperation pact has not undermined their party values (no small challenge there) and (2) capture the youth vote. Without drastic action the progressive parties will once again divide the progressive vote and we’ll sink deeper into the morass. These are just ideas I’ve been mulling over. I’d welcome any suggestions to find a way through this mess. Thanks again Carlos for your comments. They’re very helpful. Thank you Susan for your reply. In the past I sent email messages to the leaders of our NDP and Liberal parties about a possible coalition and the emails I got back were to say the least pathetic when you know they come from parties that want to govern this province. So, like Julie said in one of her posts, we do have the government we deserve. Unfortunately but true. Judging by what is happening lately, Alberta not only is going to miss the boat on good development, but also on becoming a real political, social and educational player in Canada. The fact that there are jobs everywhere right now does not mean we are a successful economy. Other than people that work in the oil industry, most other people have not had a decent raise in years and many are struglling with very high housing costs and rents. The government has a deficit and the economy according to them is booming. One wonders what is going to happen when the next bust comes! Well Susan I would love to give you any suggestions but other than a possible coalition nothing else will be possible right now. The formation of a new party is a major project and we have seen what happened to the Alberta party with which I was involved for a while. It is extremelly difficult to form a new party when the media not only does not care but no one is interested in changing the status quo. Also like I said in my previous post, democratic values and honesty are not easy to maintain when inside politics corrode the parties and make it almost impossible to make it to the government level. We had a great example with the Wildrose party when two people made absurd comments and basically destroyed the chances of Danielle Smith to become premier. At the time I thought it was great but we certainly did not know what was coming. Like you mentioned in one of your posts ‘social trust’ is very low and a lot of leaders have to put up with the extreme individualism now in our social infrastructure causing parties to be unstable and not able to battle with the vigor it is necessary today. In other words, everyone wants to be premier or have an important job in the government. The PCs are quiet right now but it will change. Alison Redford got rid of the snakes that were around at the end of the Stelmach era but it does not take long. The oil companies seem to be happy with her for now. After all she did not change anything just like they wanted.